During winter this indefatigable teaser of the smaller Gulls often ranges along our southern coasts as far as the Mexican Gulf, where I have seen it, as well as opposite the shores of the Floridas; but I never met with a single individual in summer, even in the most northern parts, although I had expected to find it breeding on the coasts of Labrador and Newfoundland. Few birds surpass it in power or length of flight. It generally passes through the air at a height of fifty or sixty yards, flying in an easy manner, ranging over the broad bays, on which Gulls of various kinds are engaged in procuring their food. No sooner has it observed that one of them has secured a fish, than it immediately flies toward it and gives chase. It is almost impossible for the Gull to escape, for the warrior, with repeated jerkings of his firm pinions, sweeps towards it with the rapidity of a Peregrine Falcon pouncing on a Duck. Each cut and turn of the Gull only irritates him the more and whets his keen appetite, until by two or three sudden dashes, he forces it to disgorge the food it had so lately swallowed. This done, the poor Gull may go in search of more; the Lestris is now for awhile contented, and alights on the water to feed at leisure. But soon, perceiving a distant flock of Gulls, he rises on wing and speeds towards them. Renewing his attacks, he now obtains an abundant supply, and at length, when quite gorged, searches for a place on which to alight, unseen by any other of his tribe more powerful than himself. When on wing, its beautiful long tail-feathers seem at times to afford this bird great assistance in executing short sudden turns, which have often brought to my mind the motions of a greyhound while pursuing a hare. By sudden lashings of its tail, it can instantly turn, or arrest its flight. When it is on the water, it keeps that part upright, but when on a rock or a floating piece of timber, it allows it to fall in a graceful manner. Although usually seen single, or at most in pairs, during the winter, I observed this species in April, on my voyage to the Florida Keys, in flocks of from ten to fifteen, congregated as if for the purpose of returning to the northern regions, where it is said to breed in groups. Mr. SELBY, in treating of this bird, says "It breeds upon several of the Orkney and Shetland Isles, and is gregarious during that period; and the situations selected for nidification are the unfrequented heaths at some distance from the shores. The nest is composed of dry grass and mosses, and its two eggs are of a dark oil-green, with irregular blotches of liver-brown. 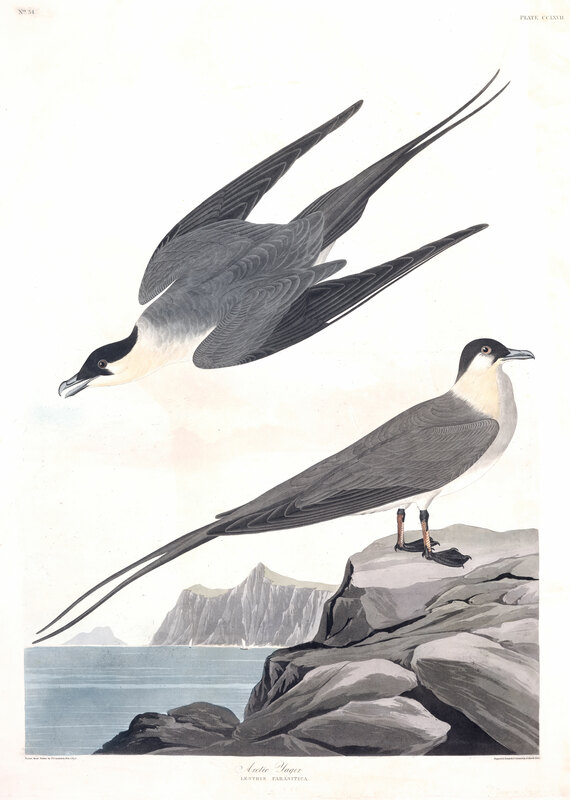 At this season the bird is very courageous, and, like the Common Skua, attacks every intruder upon the limits of its territory, by pouncing and striking at the head with its bill and wings. It also occasionally endeavours to divert attention by feigning accidental lameness." Having received eggs of this bird from individuals who had collected them, I may add that they are broadly rounded at the larger end, rather pointed at the smaller, have a smooth shell, and average two inches four-twelfths in length, by one inch and four and a half eighths in breadth. M. TEMMINCK, in his Manuel d'Ornithologie, describes the young when about to leave the nest as follows: "Top of the head of a deep grey; sides and upper part of the neck of a light grey, sprinkled with longitudinal brown spots; a black spot before the eyes; lower part of the neck, back, scapulars, small and large wing-coverts, umber-brown, each feather bordered with yellowish-brown, and often with reddish; lower parts irregularly variegated with deep brown and yellowish-brown on a whitish ground; tail-coverts and abdomen transversely barred; quills of the wings and tail blackish, white at their base and on the inner barbs, all terminated with white; the two outer shafts white; tail only rounded; base of the bill yellowish-green, black towards the point; tarsi bluish-grey; base of the toes and membranes white, the rest black, hind claw often white." In middle age, he says, "all the upper parts are greyish-brown without spots; lower parts of a somewhat lighter tint, and also unspotted; inner base of the quills and only the upper parts of the tail-feathers pure white, the rest blackish-brown; the two elongated tail-feathers gradually diminish in breadth towards the extremity, which ends in a very attenuated point; bill and feet as in the old individuals." Captain JAMES CLARK Ross has informed me by letter, that this species was seen in great numbers during his late voyage towards the Arctic circle; that the Pomarine Lestris was less abundant, and RICHARDSON'S very rare. LESTRIS BUFFONII, Bonap. Syn., p. 364. LESTRIS PARASITICA, Arctic Jager, Swains. and Rich. F. Bor. Amer., vol. ii.p. 430. ARCTIC JAGER, Nutt. Man., vol. ii. p. 317. ARCTIC JAGER, Lestris parasiticus, Aud. Orn. Biog., vol. iii. p. 470. Ranges, during winter, along and off the coast, though always in sight of land, as far as the Gulf of Mexico. Breeds in high latitudes. Bill about the length of the head, rather slender, straight, the tip curved. Upper mandible with the dorsal line straight, toward the end curved, the ridge broad and convex, the sides separated from the ridge by a narrow groove, extremely narrow and convex, the edges sharp and inflected, the tip compressed, rather obtuse. Nostrils in the fore part of the nasal groove, nearer the tip than the base, sub-marginal, pervious, linear, oblong, wider anteriorly. Lower mandible with the angle long and narrow, a slight prominence at its extremity, beyond which the dorsal line is straight and ascending, the sides sloping outwards and convex, the edges sharp and inflected, the tip obliquely truncate and rather obtuse. Head rather small, oblong, much narrowed before. Neck of moderate length. Body rather slender. Feet rather short and of moderate strength; tibia bare at its lower part; tarsus anteriorly covered with broad decurved scutella, on the sides with oblong scales, behind with smaller oblong prominent scales; hind toe extremely small and elevated, the fore toes of moderate size, connected by reticulated webs, which have their margins convex; the third toe longest, the fourth not much shorter, all covered above with numerous scutella, the lateral ones margined externally with small prominent scales directed forwards. Claws of moderate size, curved, acute, compressed, that of third toe with a sharp inner edge. The plumage in general is close, elastic, soft, and blended; the feathers on the back and wings rather compact and distinct. Wings very long, rather broad, pointed; primary quills tapering and rounded, the first longest, the rest rapidly graduated; secondary rather short, rounded. Tail feathers of moderate length, excepting the two middle, which are extremely elongated and gradually attenuated, the rest broad and rounded, there being twelve in all. Bill greyish-black, the upper part bluish. Iris brown. Feet black, but with the greater part of the tarsus yellow. The neck and lower parts are white, the former tinged with yellow; upper and fore part of head with the space before the cheeks blackish-brown; the lower part of the hind neck and all the tipper parts blackish-grey, the primary quills and tail-feathers brownish-black, the shafts of the former white. Length to end of tail 23 inches, to end of wings 15; extent of wings 45; wing from flexure 12; tail 12; bill along the back 1 1/4, along the edge of lower mandible 1 3/4; tarsus 1 7/12; middle toe 1 4/12, its claw (4 1/2)/12. The female resembles the male, but the middle tail-feathers are about three inches shorter.